One of the nice things about living in Denver is the proximity of several companies that house rocket scientists. Even better is when rocket scientists have a conference and invite teachers! I was fortunate to attend the AIAA Science Conference in 2009, amassing a whole new set of teaching tools to help kids get into Space-figuratively and, who knows, literally. Once again, I was jazzed by the possibilities I could include in my space unit. I had already been using the GEMs unit, Moons of Jupiter, to supplement the pretty dry curriculum we had. 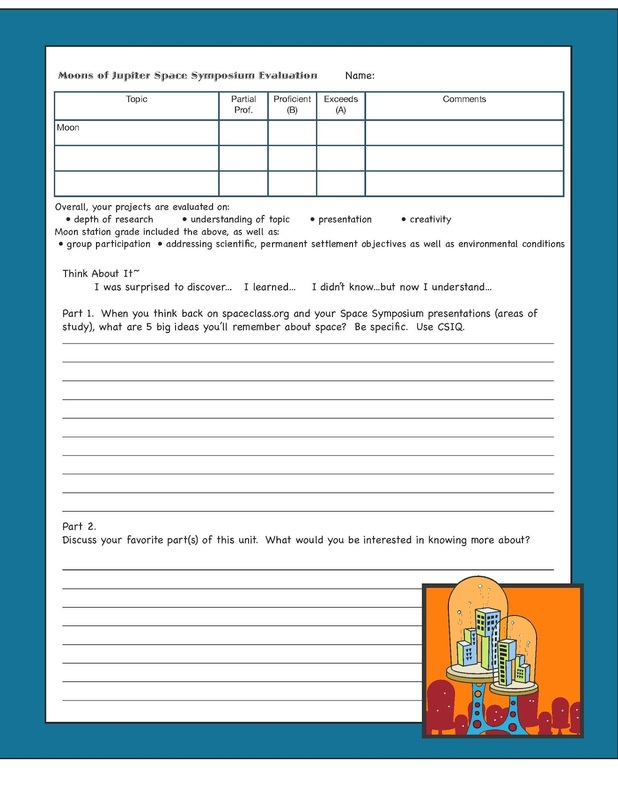 This conference introduced me to Space Class, an online set of videos, interactive virtual labs, online quizzes, extensions and a teacher’s guide. It’s hosted by NASA astronauts and experts, giving background information and narration to the really fun lessons for kids. It’s designed for grades 5-12 and is free! 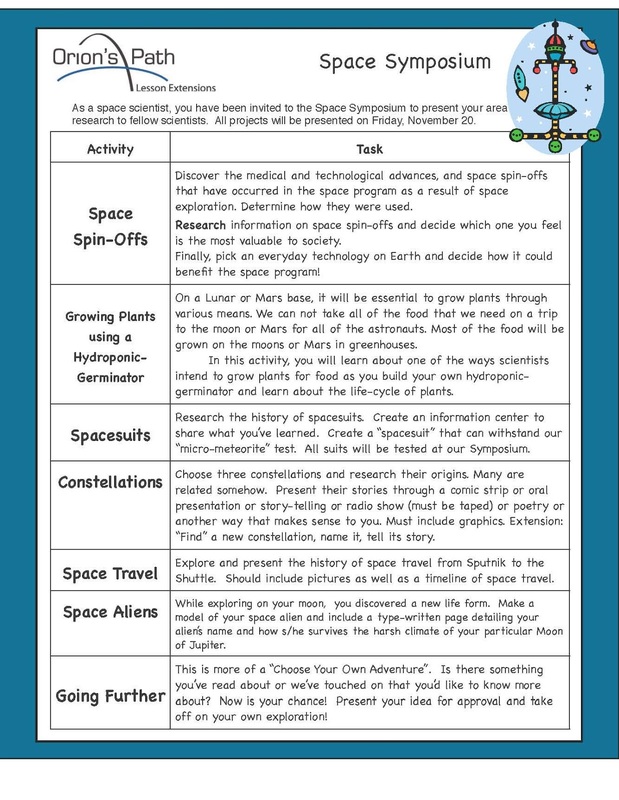 Space Class not only jazzed up our Craters of the Moon requirements, it took us into deep space! (I’m going to have fun with this.) Moons of Jupiter focused on the big 4, Io, Ganymede, Callisto and Europa. Space Class added Orion’s Path, Journey to a Black Hole, Asteroid Challenge, Mission to Mars, and Bones in Space. And just to keep things interesting, I threw in the Mars Rover video. If you haven’t seen it, it’s amazing! It shows how groups worked together for a common goal. Usually, I’d end the unit with the presentation of their lunar space stations and an assessment. 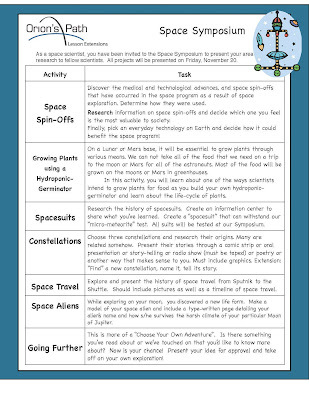 This time, with all this great information and wonderful activities to get kids excited about space exploration, I wanted them to have time to explore their favorite parts of what we just finished and present their independent projects. Still thinking about the AIAA Science Conference, I decided we needed to have a conference of our own. We’d call it... Space Symposium! In addition to their moon space stations, students chose from a list of projects they could present at our symposium. Much of the work for their independent projects would have to be done at home. We were working on their space stations in class, but I built in some computer time for researching and writing their final presentations. Their final projects would have a self-assessment. To put us in the mood each day, I downloaded the themes from Star Wars, Star Trek, Stargate SG-1, Back to the Future and Classical Gas and played them at the beginning of our work sessions. I, also, used them as a transition/clean up signal. They loved it. One of the fun experiments we did came from Space Class in the Asteroids segment on the importance of space suits and what would happen if they were hit by a micro-meteorite. Students were given a balloon representing his/her astronaut. 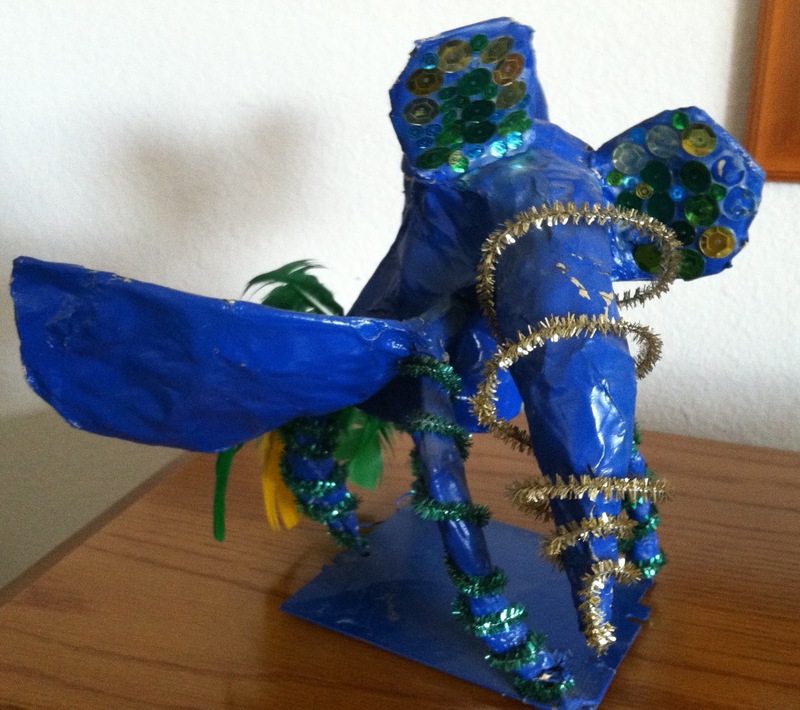 I also had different materials available to create space suits. When they felt their astronauts were “safe”, we traveled to the moon (the gym). From a very high ladder, I released a “micro-meterorite (nail hole punch) down a PVC pipe on to the unsuspecting “astronaut” at the bottom. Oh, the carnage. Very few survived. The history of spacesuits, of course, had to become one of the Symposium categories. Space aliens was another fun option. Back in the day, when there was time to expand topics a bit more, we made the paper maché space aliens. The assignment was to create an alien that would be able to survive the harsh living conditions on whichever of Jupiter’s moons you were on. They had to name their creature and explain how it was adapted to eat, breathe, drink, protect himself- everything a creature on our planet would have to do to survive. For this symposium, the work would be done at home with a class brainstorming session of what they could use. They would add a written piece describing their discovery. I liked the Space Spin-Offs segment. I never realized how many products we use every day were originally designed by NASA or for NASA. We sampled ice cream dots and TANG. (Yes, they still make that icky drink!) Their assignment was to discover the medical and technological advances, and space spin-offs that have occurred in the space program as a result of space exploration, and determine how they were used. They needed to research information on space spin-offs and decide which one they felt is the most valuable to society. Finally, they were to pick an everyday technology on Earth and decide how it could benefit the space program! Students were encouraged to bring as many of the inventions as they could to supplement their presentations. I had high hopes for Hydroponic Germinators, as there were several students wanting to try them. I gave them the initial information, but I learned that that choice needed more teacher supervision to see it through. Depending on where you teach, students don’t get the support to follow through on these projects for a variety of reasons that I’m sure you already know, so I won’t dwell on current realities. We had one finished to completion, and it was one of the star attractions. Constellations and mythology were a natural pairing. Students chose three constellations and researched their various origins. They present their stories through a comic strip, oral presentation, story-telling, a radio show (had to be taped), through poetry, or another way that made sense to them. They had to include graphics. The extension was to “find” a new constellation, name it, and tell its story. In my need to spread the word that science is fun, other classes were invited to view our Space Symposium, held in the library. After all, what good is a symposium, if there’s no one around to learn from it? Throughout the morning, classes visited, asking questions, watching spacesuits survive the micro-meteorite shower (or not), and sample space ice cream. If I was still in the classroom, I’d definitely do this again. It was like a mini-science fair; fun to watch the younger kids ask questions about the space stations, the aliens, taking in all the exhibits. The next time, I’d have a table set up so visitors could make their own spacesuits, like we did in class the first time. Not surprising, there were many requests from kids to try it themselves. Wanting to immerse them in space, I chose several books for reading groups with a space theme, using A Wrinkle in Time as my read aloud. Ender's Game and Transall Saga were a couple choices used, but any science fiction or mythology book would work well. 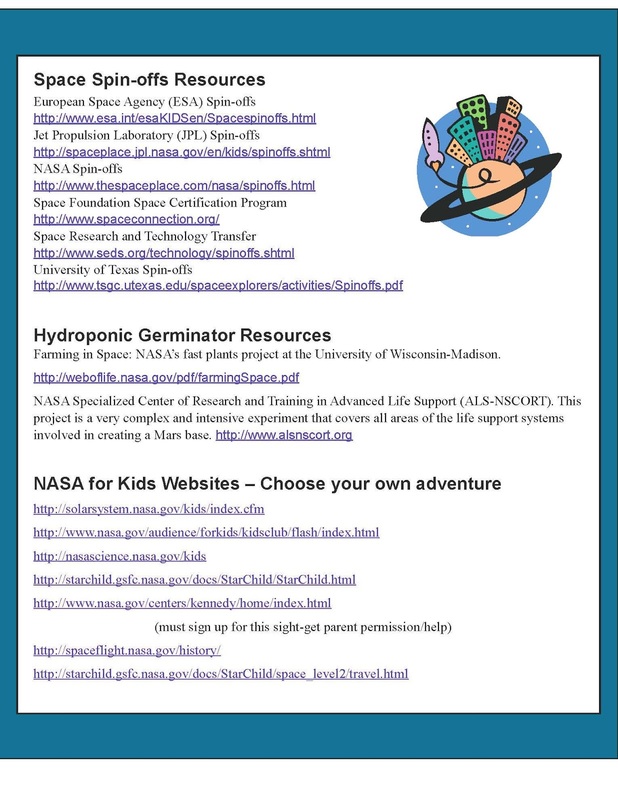 Check out my Teacher Resource page for more information on Space Class, Moons of Jupiter, and Space Day. Also, if you’re not already getting it, NASA has a free newsletter that comes out once a week and an excellent teacher page on their website. I completely believe events such as Space Symposium are what get kids interested in learning. It definitely tapped into their creativity! It was definitely fun. And I ask you, can there ever be enough space study? The looks on their faces when their astronauts spacesuit popped was priceless! Pam, you never cease to amaze me with your creativity and cleverness! Your students were so darn lucky; this sounds like so much fun! I usually do a spring unit on sci. fi. turning to sci. fact, which was so much fun for students. But our curriculum is pretty much dictated to us now, so I don't think I can fit it in this year. I am going to sign up for NASA's newsletter though. Thank you! Thanks Darlene. :) I think my underlying motivation is, let's have fun while we're learning! It was getting harder and harder to do fun things with kids, until after testing, so I feel your pain- I don't thrive under someone telling me what to do. 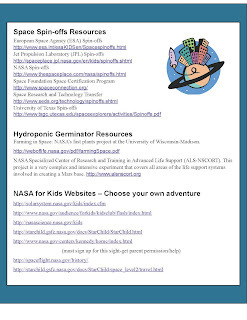 OK, I added the NASA Bulletin Newslink as a hotlink because it's not that easy to find on the site. Hopefully, it will stay active from week to week. There's an email signup in the upper right corner of the page, along with several other opportunities to follow them. Oh, my!! As a Stargate SG-1 fan and a former Trekkie, you would have been my favorite teacher EVER!! Love all of your ideas! Thanks, Leah! I love SG-1, also- especially when they had to "MacGyver" something and he'd get that funny look on his face. :) I'm a firm believer that kids learn best when they're having fun and emulating real life.